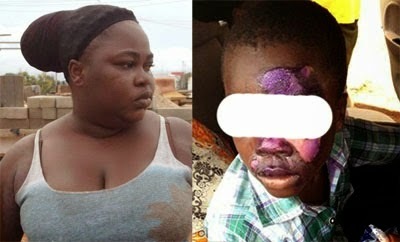 11-year-old boy at New Takoradi Lower Town in Ghana gets burnt with an electric iron by his own mother for allegedly stealing GH¢5.00 belonging to the little boy’s friend. Daily Guide leant that the boy is currently receiving treatment at the Effia-Nkwanta Regional Hospital in Sekondi, Western Region, for the multiple burns he sustained. This paper gathered that the 28-year-old mother is in the grips of the Takoradi police while investigations into the incident continue. Speaking to journalists, Emmanuel Edwin Adogo, Assemblyman for Lower New Takoradi, disclosed that the little boy, Bernard Asafua, confessed to stealing the money belonging to his classmate after initially denying committing the offence. Mr. Adogo explained that the boy’s initial denial angered his mother who allegedly injured the boy with a hot iron after subjecting him to severe beatings. According to sources, the grandmother of the boy rushed to his rescue when she heard him screaming while he was being beaten and also the pains he was feeling from the burns.